When we're having people over for dinner, I like to have everything done in advance. I often adapt one of our favorite recipes so it can be made completely ahead of time and served straight from the oven, like baked pasta. I've written before about how great baked pastas are for entertaining - they are easy and everyone loves pasta. Here, I've adapted our favorite Beef, Tomato & Wine Ragu (normally served with homemade Pappardelle pasta) to a baked pasta with store-bought Rigatoni topped with Ricotta & Mozzarella cheese. I especially like how rustic and casual this is - everyone will feel right at home when they see this comforting looking dish on the table. It is a very low maintenance recipe - the sauce slow cooks in the oven all day, then add the cooked pasta and top withe cheeses. From there you can put it into the refrigerator to reheat later, or put it straight into the oven and hold it there until you're ready to serve it. Cook pasta in a large pot of boiling salted water until it is Al Dente - or still firm, as the pasta will continue cooking in the sauce. I usually cook it 2-3 minutes short of the cooking time for the best result. 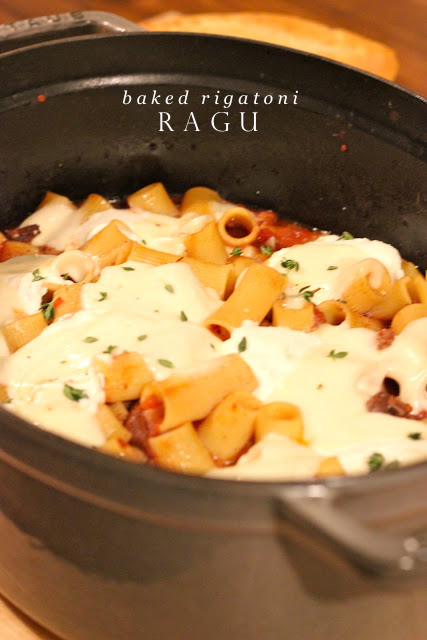 Strain the pasta and put it directly into the oven-safe crock with the ragu. Stir in and combine it with the sauce. With a large spoon, dollop the ricotta on top of the pasta, then follow with slices of mozzarella. Garnish with fresh thyme or basil. If serving immediately, put it back into a 250 degree oven, uncovered for 10-20 minutes until the cheese has melted. If you are serving later, refrigerate it, then put it into a 300 degree oven for 30 minutes to completely reheat. This looks delicious like all your recipes do! I'm putting this on my menu for next week! I am confused though, what sauce did you use? Thank you for clarifying; it is probably mentioned and I can't find the information. Mari - The Beef Ragu recipe is the sauce. If you want to make the sauce go further, you can add another can of tomatoes. Thank you; I now understand and look forward to making this in a few weeks. Mmmmm! Made this for a special dinner tonight for my husband and I. Our house smells...amazing. We can't wait until dinner time.